I’ve set a goal to design and knit a pair of mittens every month in 2014. 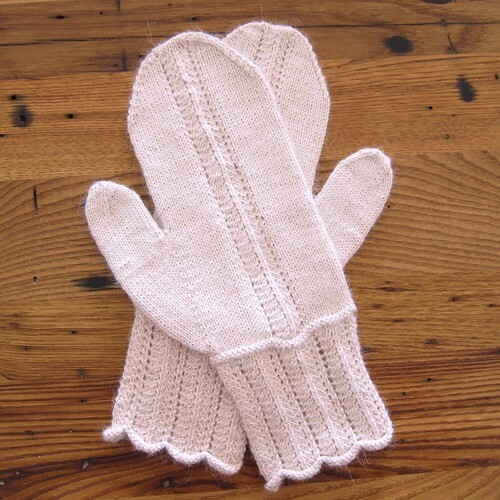 For February’s mittens, I want to make something a little lacy and romantic, BUT they still had to be warm. The answer was a beautiful, fuzzy silk alpaca yarn in the palest of pinks and a not-too-open lace pattern. 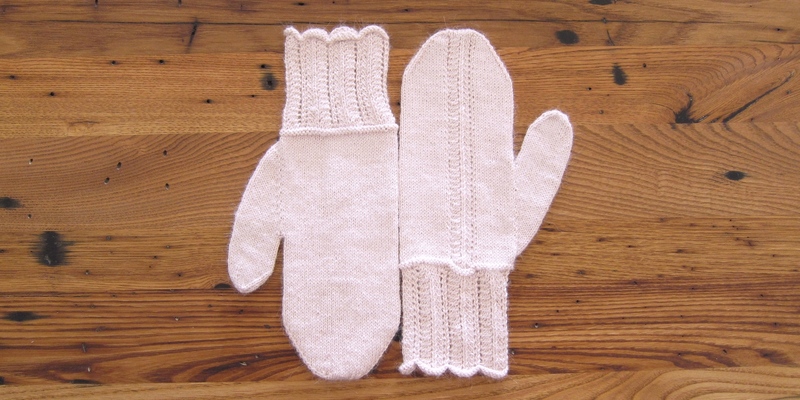 These are not your “play in the snow” mittens, but rather your “look pretty even though it’s freezing out” mittens. This is a great pattern if you haven’t had much experience knitting lace patterns as it is only a two row repeat. Plus, you are only doing simple knit 2 togethers and yarn overs to get the lace pattern. This mittens are knit to fit a women’s medium. Cast on 63 stitches with smaller needles. Divide stitches between three needles. Join to knit in the round, placing a stitch marker between the first and last stitch to mark rows. Row 2: *k1, yo, k2, k2tog, k2tog, k2, yo, repeat from * until end of row. Row 3 – 34: Repeat rows 1 & 2 sixteen more times. 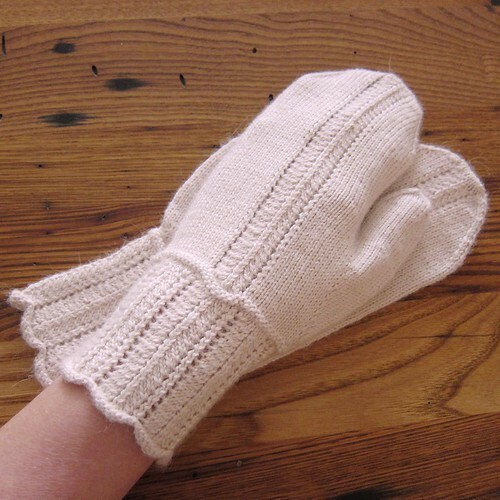 Repeat rows 76 and 77 until mitten reaches top of your little finger. For me that was 13 more times, which made the hand length of my mitten 5 ½ inches. Do one more k round. Place the first eight stitches on one needle and the second eight on another. Bind off with the kitchener stitch. Put the 27 thumb stitches on 3 needles, 9 per needle. Pick up and knit 2 stitches from the hand of the mitten. Place stitch marker after those two stitches. 29 stitches on the needles. 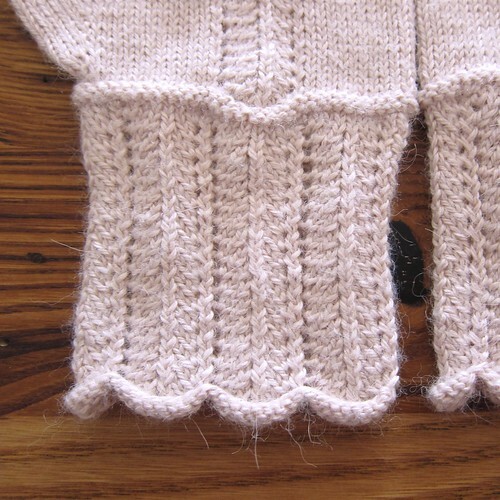 Continue knitting until thumb reaches mid thumbnail, about 1 ¼” – 1 ½”. Do not copy for distribution, sell, repost, claim as your own or teach this pattern without permission. 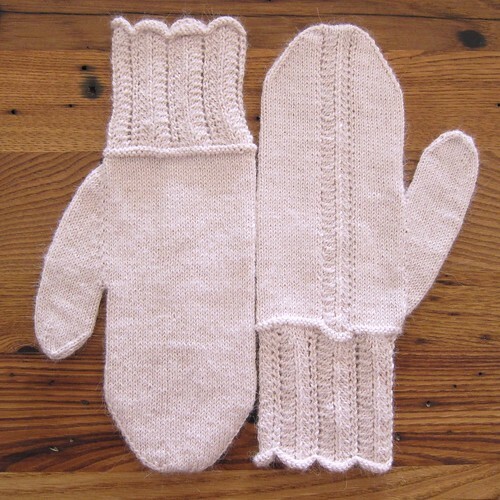 Another great pair of mittens. These are beautiful. “look pretty even though it’s freezing out” mittens. This is so appealing to me right now. Clothing has been so limited right now with the deep cold. It’s these superficial things I need to lift my spirits. Your mittens are gorgeous and perfect for a Valentine’s date night! I know what you mean. I feel like all anyone sees is my coat and mittens these days. These are stunning. I especially like the extended cuff. Well done. Thank you. I was tempted to do an even longer evening glove type cuff. Beautiful mittens! Are they warm enough for Minnesota dead of winter? I love the lace. Kathee – That alpaca silk is pretty warm. I wouldn’t wear them for all day outside, but to get to & from dinner out, yes.